April 6, 2017 - The joint NOAA-Environmental Protection Agency hazardous chemicals database is now available as a mobile app. Named CAMEO Chemicals, the database has information on thousands of chemicals and hazardous substances, including response recommendations and predictions about explosions, toxic fumes, and other hazards. Firefighters and emergency planners around the world use CAMEO Chemicals to help them prepare for and respond to emergencies. CAMEO Chemicals was already available as a desktop program, website, and mobile-friendly website. You can download the new app to view key chemical and response information on smartphones and tablets. Once downloaded, you can look up chemicals and predict reactivity without an internet connection—making it a valuable tool for emergency responders on the go. With an internet connection, you can access even more resources, like the National Institute for Occupational Safety and Health Pocket Guide to Chemical Hazards and International Chemical Safety Cards. Search by name, Chemical Abstracts Service number, or United Nations/North American number to find chemicals of interest in the database of thousands of hazardous substances. 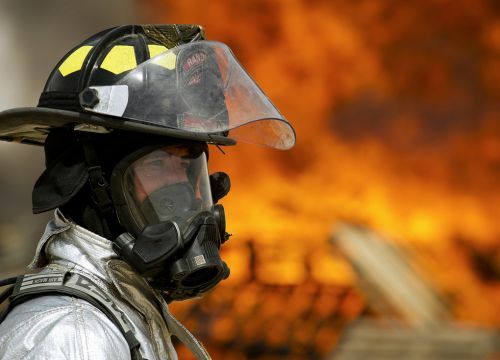 Find physical properties, health hazards, air and water hazards, recommendations for firefighting, first aid, and spill response, and regulatory information. Predict potential hazards that could arise if chemicals were to mix. Quickly access additional resources like the U.S. Coast Guard Chemical Hazards Response Information System manual, the National Institute for Occupational Safety and Health Pocket Guide, and International Chemical Safety Cards. Find response information from the Emergency Response Guidebook and shipping information from the Hazardous Materials Table. Emergency Response Guidebook PDFs are available in English, Spanish, and French. Save and share information with colleagues. 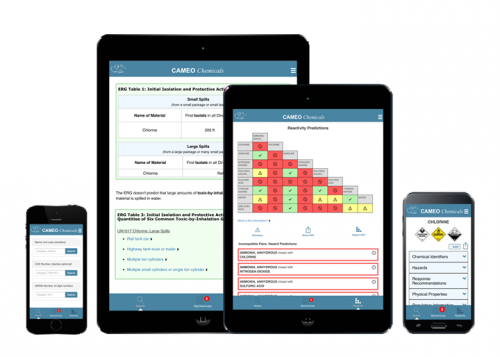 The mobile app is part of the CAMEO® software suite, a set of programs offered at no cost by NOAA's Office of Response and Restoration and EPA's Office of Emergency Management. This suite of programs was designed to assist emergency planners and responders to anticipate and respond to chemical spills. You can download the new CAMEO Chemicals app in the Apple App store or Google Play Store. Kristen Faiferlick of NOAA's Office of Response and Restoration contributed to this article.